Very Dangerous Situation. 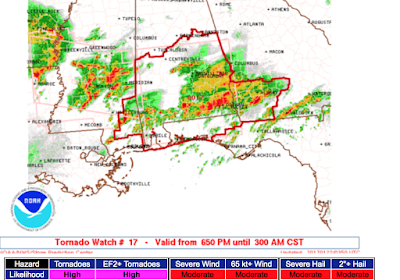 See forecast for entire region below tornado watch. Has been issued until 3am for the southern two-thirds of Alabama, the Florida Panhandle and a small part of eastern Mississippi. Very few tornado watches, fewer than one in twenty, are "particularly dangerous situation" watches. Note: Watch extended into Florida at 9:50p CST. 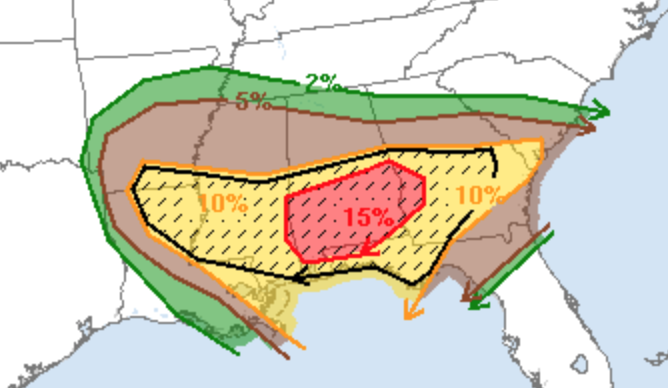 Please note the risk of violent tornadoes overnight is "high." Here is the forecast for tornadoes from now until 7am. Brown, 5%, is the threshold for tornadoes. Yellow is an elevated risk. Red is, in my opinion, a high risk. The hatched area means violent tornadoes are possible. This is a very dangerous situation! !